Layering sounds of different instruments is a great way to get creative with your keyboard. 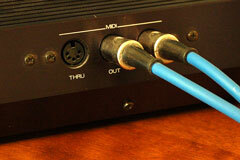 A system called MIDI, which stands for Musical Instrument Digital Interface, makes this possible. 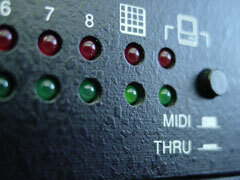 In a nutshell, MIDI allows one electronic musical instrument to communicate with another. Your digital keyboard has special "in" and "out" ports that allow you to establish this connection. How does MIDI work? Well, let's say you have a portable keyboard and a digital piano. Can you combine the grand piano voice with the keyboard's strings? Absolutely! All you need to do is connect the MIDI OUT port on the piano to the MIDI IN port on the keyboard. Be sure to select the same MIDI channels on both instruments, then select the sounds you want to hear from each instrument. As you play the piano, the keyboard will play along. In this situation, the piano would be considered the master instrument and the keyboard would be the slave instrument. When you play a certain key on the piano, MIDI tells the keyboard to play the same key. MIDI will also make note of how hard you play. This is called the velocity message. As you play more loudly on the piano, the keyboard will sound louder as well. Also, if you operate the modulation wheel on the master instrument, the slave instrument will respond. You can send control changes to alter things like volume, panorama, and panning, or you can send a program change command to modify the sound on the slave instrument. MIDI also allows you to hook up your instrument to your computer, as long as your computer has a sound card with a MIDI interface. 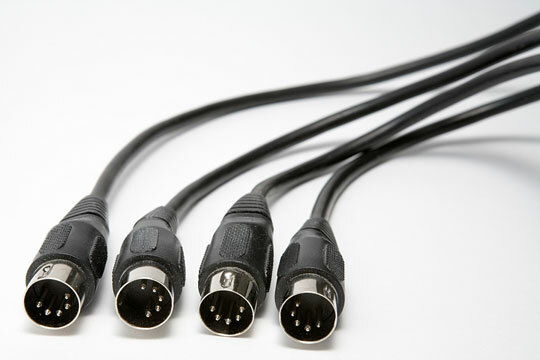 Alternatively, your instrument can have a USB port that doubles as a MIDI connection. As long as you have the right software, MIDI can be used as a sequencer, recording studio, interactive teacher, and much more.